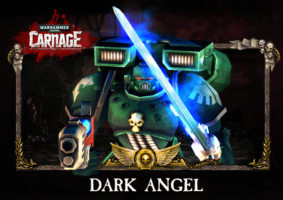 Roadhouse Interactive Limited, a leading developer and publisher of tablet, mobile and browser games, today released the first major content update, featuring the Dark Angel Space Marine and an abundance of new content, to the wildly popular Warhammer 40,000: Carnage for iOS and Android. Roadhouse Interactive Limited, a leading developer and publisher of tablet, smartphone and browser games, today released Warhammer 40,000: Carnage for Android, after the iOS version featured as a Best New Game in over 80 countries, consistently topping many categories throughout May. Android fans of Carnage, who have been eagerly awaiting the Google Play release, will be in a total frenzy. Roadhouse Interactive Limited, a leading developer and publisher of tablet, smartphone and browser games, today announced that Warhammer 40,000: Carnage is now available in 100+ countries (including more European, Nordic, and African countries, plus many other regions of the world), with added French, German, Spanish and Italian languages for iOS.